A Battersea restaurant dishing out classy kebabs. Is there such a thing as a classy kebab joint? According to this Battersea newbie, there is. Pride of place is a bespoke charcoal grill complete with sections for ‘slow-burning’ and ‘intense heat’. It’s a smoking, serious piece of kit. It says: yes, we make kebabs, but not as you know them. Ingredients are carefully sourced and lovingly prepped. 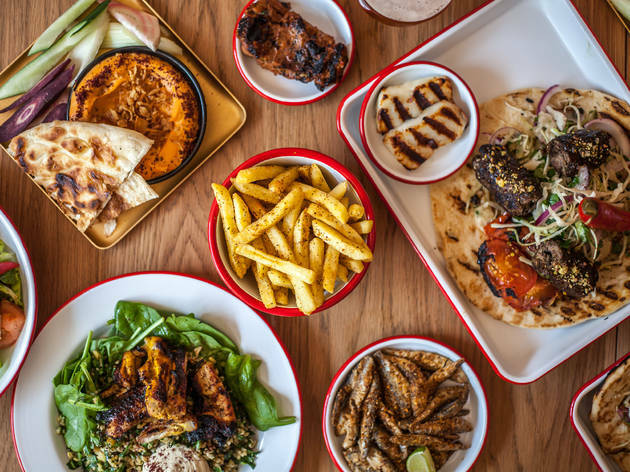 There are just four ‘fillings’ – saffron and orange chicken, beef shortrib, lamb shoulder or broad bean falafel – served either over a grilled flatbread, or with their rustic take on a fattoush salad. But, like I said, these are no ordinary kebabs. First of all, portions are generous: you could easily come just for mains, if it wasn’t for the fact that the starters are too good to skip (more on these later). Flavours are equally big: full of Middle Eastern spicing and fresh, zingy herbs. A pile of melt-in-the-mouth, slow-rotisseried lamb was served over two kinds of shredded cabbage and pepped up with red onion and parsley. There are sweet, crisp ‘pomegranate onions’ (red onion chunks roasted in pomegranate molasses) and two ‘house sauces’: a tongue-in-cheek take on kebab house classics (‘red’ is a harissa-and-garlic-laced tomato number, ‘green’ a herby yoghurty one, with a hint of garlic). And if you swap your bread for the ‘fattoush’, your plate suddenly looks refreshingly healthy, full of colour and crunch. But anyway, those starters. 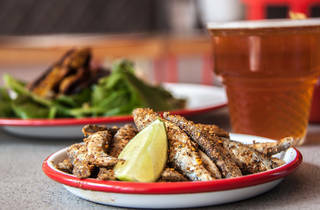 From the two-tone ‘dip’ of good-quality labneh with a blob of rose harissa suspended in its middle, to the dukkah-smothered deep-fried whitebait, to the restrained, creamy houmous, they’re simple, yet sensational. 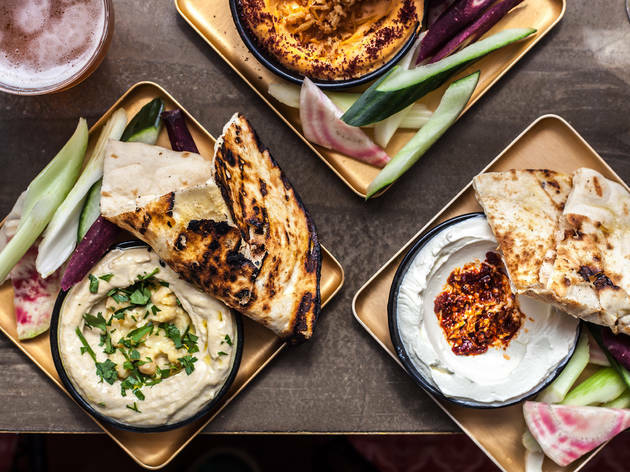 Each comes with a flame-blistered flatbread (from a south London-based Syrian baker) and the kind of big, butch crudités that make the celery batons you serve your mates look like charity shop knick-knacks. Giant wands of cucumber, hunks of beetroot, quartered raw fennel. It’s not all perfect: a side of ‘smashed aubergine’ was far too sweet (lay off the pomegranate molasses here, guys), and while I loved the idea of marrying rotisserie pineapple to ice cream, tahini and pistachio, in practice it was destined for divorce. Still, the staff are young and fun-loving (of the trio of co-founders, Eve and Travis met through a mutual love of ultra-running; a friend at Pizza Pilgrims introduced them to head chef Jono: ‘Wow,’ they said when they met him, ‘he’s the one’. Then waited anxiously to see if he would text back). They crack jokes while dishing out frozen margaritas and turning up the Turkish pop music. The expression ‘hidden gem’ is a platitude, but this small, friendly restaurant is just that. Against Battersea’s dull chain brigade, it’s a glittering, pomegranate-coloured jewel. Popped to Battersea Rise last Tuesday for dinner with my brother and we were drawn in by the new restaurant on the street and I'm so glad we were! Outstanding food, so fresh and full of flavours, lovely staff and a good chilled but buzzy atmosphere....even on a Tuesday night. Will be back soon! I visited this new restaurant during their soft launch period. It's a real stand-out addition to Battersea Rise. It has an eye-catching frontage and inside the design is simple but classy. We were welcomed with a complimentary frozen margarita and the waitress was on hand to answer any questions we had. She even let us taste the different red wines so we'd be better able to choose a glass. The food was tip top. The hummus was some of the best I've ever eaten, and the griddled flat bread was a delicious accompaniment. The mains were sizeable portions all served on one lovely dish. Meat, bread, salads - and fiery or cooling dips to accompany. The lamb was full of flavour, the chicken dish was equally delicious and the dukkah fries were a moreish addition. I will definitely be returning to try out all the dishes I didn't try the first time around. A great new addition to Battersea Rise. My husband and I visited and over ordered because it was all too appealing and the staff so helpful. Settle in with some of the nibbles - the sweet potato tahini was delicious (although a little strangely served with radishes - we were told this was quite authentic). We personally loved the lamb shoulder kebab with the salad. This is where we started to over order, the mastello cheese was a great side - think hallloumi but better; the pomegranate onions complemented the lamb superbly and the fries was so moreish, we didn't think we would have room for dessert. But when we saw the toasted marshmallow peach melba coming out of the kitchen, we, well I couldn't resist. We rolled home happily having had one too many cocktails and beers and will definitely be returning soon! What a fab new spot. I can highly recommend. Beautiful food, lovely craft beers, fab atmosphere and very friendly staff. Back ASAP for more Bababoom delights - dying to try the brunch menu! Particularly LOVED the puddings - chocolate cardamom pudding was inspired. See you soon. Don't get discouraged when you see how packed this small and cozy place gets - we didn't have any trouble getting a table. We came here as part of Timeout's dinner for two and the bill for this place was half of all of the other places on the program. The sweet potato hummus has an amazing smoked flavor and the flatbreads are beautifully charred. It's a bit hard to access via the tube lines but we will definitely be making the trek out again soon. Bababoom could be described as a ´fancy kebab place’ but that wouldn’t be quite right. Yes it’s kebabs, but not as you know it! Delicious meat (we had the marinated mutton), tasty sides (try the avocado tahini, I am still dreaming of it) and massive portions, everything is here to make you change your idea of kebabs. We came as walkin and they found us space at the counter within 10 minutes! I visited for a birthday party on a very hot summers day - the place was understaffed and we were on a table too small for our party, so it was quite a long wait for food and felt like a very hot & crowded restaurant. However, the staff explained they were 3 down that day, and the weather was not doing anyone any favours. 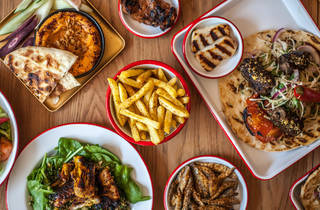 Once the food arrived it was well worth the wait - excellent quality ingredients and really tasty flavour combinations. I'd go again, but maybe in a smaller group. We booked a table last Sunday for a brunch and power hour with unlimited frozen margaritas, mimosas and bloody Mary. The food was really good, the service super friendly and margaritas fruity and strong - just how I love them! Its tiny so dont forget to book beforehand. Walking into Bababoom my first impressions are great, although the place is on the small side so I completely walked past it the first time. As a group of 4 we had pre-booked for 7.30pm which is highly recommended as this place fills up fast. 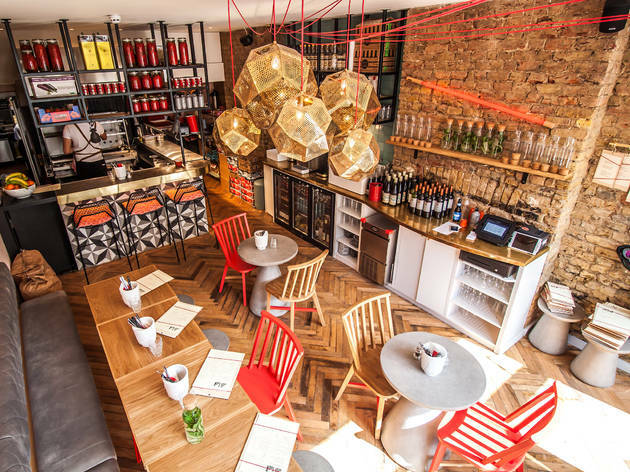 With cool pendant lights hanging from wires and quirky seating, the décor game is strong and definitely transforms it from being a posh kebab place to a restaurant in its own right! While you are enjoying some drinks you can see the chefs at work in the open plan kitchen or perch up at the window for some people watching. The menu itself is a little gem, with 5-6 start/ nibble options such as houmus (sign up to their newsletter and get one free! ), olives etc. and follows onto kebab mains ranging from £10-12. The two recommended by our waitress were delicious and were the chicken and lamb with pomegranate. We also ordered fries and tabbouleh for the table but to be honest the kebabs were filling enough with the flat breads. A lovely place for a posh kebab in a nice setting which doesn’t break the bank for midweek dining. 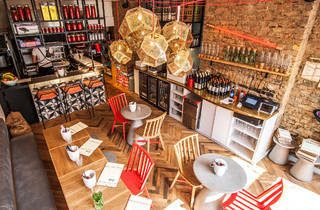 A refreshing newbie on the scene that serves good portions and colourful, fresh food. Battersea rise is such an underrated area with so many cool cocktail bars on the same road, such as The Walrus Room which is a candle lit speakeasy cocktail bar filled to the brim with taxidermy and all sorts of vintage paraphernalia! If you're like me, the name of this place will be enough to convince you to visit this amazingly alternative brunch heaven. Herby couscous, roast peppers, lamb kebab and toasted flatbread. We all love them, but I have never thought of putting them together on a plate, top the combination with poached eggs and serve it for brunch. That is what Bababoom has done very impressively. The staff is lovely, the bottomless filter coffee is deliciously appreciated and the food is magnificent. We went with a friend and her two kids so didn't want to try the bottomless brunch, but we will definitely be back to give it a whirl. 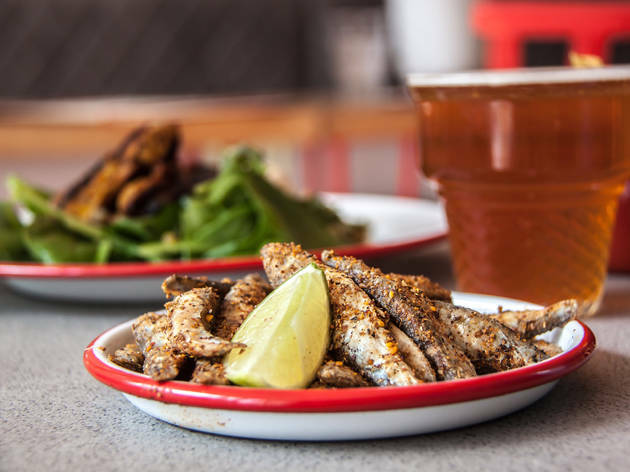 Bababoom is a welcome addition to the already great restaurant selection around Clapham Junction. They take reservations which was very helpful because at 1:00 on a Saturday, the restaurant was pretty much full. All of the dishes we ordered were excellent, colourful, Mediterranean food with a smoky charcoal flavour and portions were larger than I was expecting. Their main cocktail is the frozen margarita which was nice and not overly sweet. 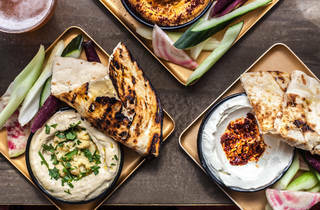 The various flatbreads filled with grilled meats or falafel were so fresh and moreish and it’s definitely worth ordering some sides to share. We had the aubergine and squash with feta, both of which I would order again. Unfortunately the service let things down a bit - our server was very friendly but we weren’t given water until the end of the meal even though we asked at the beginning and our second order of margaritas was completely forgotten. Apart from the patchy service, I would still go back for the fantastic food. Went for brunch with my wife and three year old. The front of house so light and airy - the juices and strong coffee, were very much needed. Their date cured bacon is ruddy heavenly and loved the flatbread french toast. The kids menu is excellent value and my boy wolfed it up. It feels like such a good find for the area. Go, while you can get a table. Loved the brunch at BabaBoom. The whole menu is Middle East inspired; the eggy bread with bacon is to-die-for and the nutella, banana, clotted cream and honeycomb pancakes were delicious. Loved their deco and the friendly service. I will definitely pop back in to try the evening dishes. Staff are incredibly friendly, buzzy fun atmosphere and food is incredibly tasty! Loved it! Funky atmosphere and cool vibe in addition to amazing food. The lamb shoulder kebab was a standout and I need to get more chips with dukkah - I've dreamt about them. Love this place, can't wait for it to be fully open. Amazing food, especially the lamb shoulder kebab and the marshmallow dessert - inspired! Friendly and fun staff - would recommend it to everyone. Who knew that kebabs could be so amazing! Feeling hungover and on the hunt for brunch in the Clapham Junction area, I was surprised to find this newcomer on Battersea Rise. I was a little apprehensive about a charcoal kebab place being able to satisfy my cravings but I was tempted by the refillable coffee by Caravan nonetheless and an assurance that there sausages would perk me up so much, I'd be on the bloody Mary's before I knew it. The service was excellent, the atmosphere hit just the right note for brunch, the meat brunch option was fantastic and I'd return next week. Take up the soft launch offer, don't mean to be too harsh, the quality and the portion of the food is small compared to the actual price charged. Dried dried meat, almost difficult to swallow. Not sure about the food quality, very tiny place to be called a restaurant, more suitable for a takeaway. Rather too ambitious. Marketing Marketing Marketing! But no follow up! But when i came tonight 23rd August, the lady on the front door told me "oh it's 1h45min wait", i replied "it's ok, so can i come later on?" She just smiled turn way back and said "it's better to come back during lunch time"
They have lost already local customers as i won't definitely recommend this place to any of my neighbours as having that kind of service...no thanks!! !